This tutorial provides you with a foundation for working with Adobe Photoshop Elements selective changes. It is the eighth lesson in the Adobe Photoshop Elements 10 Digital Classroom book. Now that you have lightened the image, you will make a selective adjustment to just one section of the image, using the selection tools. In this example, you will select and darken the face of the girl in the front right of the photo. 1 Click and hold down the Rectangular Marquee tool ( ) and select the hidden Elliptical Marquee tool ( ). 2 Focus on the girl in the bottom right of the image in the foreground. Click and drag from the upper left area of the girl’s face to the lower-right area to make a selection that surrounds her face. You can reposition the selection by clicking and dragging it. Note that you need to have a selection tool active in order to reposition the selection without moving the pixel information. 3 Choose Select > Refine Edge. The Refine Edge dialog box appears. 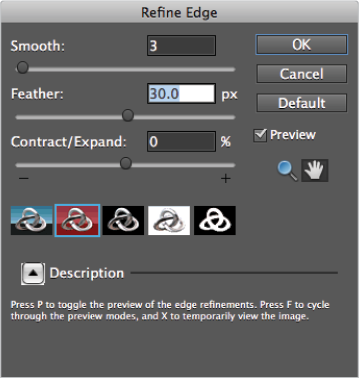 Press the Custom Overlay Color button ( ) in the bottom-left corner of the Refine Edge dialog box. This reveals your selection, as the clear area in the red (default mask color) mask. You can view the changes in your selection by keeping an eye on the mask. 4 Click and drag the Feather slider to the right to about the 30-pixel position. This softens, or vignettes, the selection so that any corrections you make (within that selection) blend into the rest of the image more smoothly. Press OK.
Feather the selection to soften the adjustments you will make. You will now take advantage of the Adjustment Layer mask (the white rectangle) that sits to the right of the adjustment you made, in the Layers panel. If you remember, you lightened the entire image when you created the initial layer mask. You will now use your selection to block that adjustment from occurring around the girl’s face. 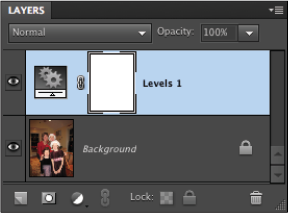 5 To make sure that the adjustment layer’s mask is selected, click once on the mask of the Levels 1 layer in the Layers panel. 6 Press D on your keyboard to set the foreground and background colors to their default black and white colors. Press X once. By pressing X, you switch the foreground and background colors. Look at the bottom of the Toolbox to verify that the black (foreground) color is in front of the white (background) color. 7 Choose Edit > Fill Selection; the Fill Layer dialog box appears. Leave it at the defaults, as shown below, and press OK. The layer mask now has a black feathered area. Where the black is on the mask, the image is no longer adjusted. Essentially, you are blocking the lightening adjustment that you made on the initial adjustment from occurring in the girl’s face, and so her face is darkened. Because you feathered your adjustment, it is faded into the rest of the image. Finally, remove the selection by choosing Select > Deselect. Choose to fill your selection with black. The adjustment layer effects are blocked where the black appears.